As mentioned, I am proud to speak at this year’s Experts Live Europe 2017 in Berlin, Germany. Today is your lucky day. If you want to join me at this amazing conference and you do not yet have a Conference Pass, you have the chance to win one today. The full 3-day conference pass is worth €761.60 and gives you access to all sessions, the expo hall, the attendee networking party and the closing party. Experts Live Europe is one of Europe’s largest community conferences with a focus on Microsoft cloud, datacenter and workplace management. Top experts from around the world present discussion panels, ask-the-experts sessions and breakout sessions and cover the latest products, technologies and solutions. It’s the time of the year to learn, network, share and make valuable connections. Leave a comment on this post with a great reason why you want to attend until August 9 23.59 (UTC +1). Under all comments I will raffle one regular conference pass. The winner will be contacted by email. Good Luck! And for those who didn’t win, you still have the chance to buy a ticket! I am proud to announce that I am now a Microsoft Certified Trainer. I got the official certification a couple of months ago, but I didn’t have time to share it yet. A Microsoft Certified Trainer (MCT) is a professional trainer, who has been certified by Microsoft as an expert in terms of professional knowledge and with the ability to properly impart this knowledge to others. 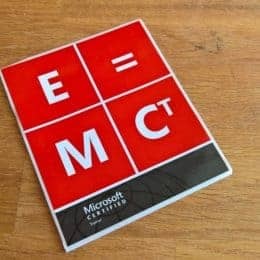 MCTs are considered as the premier instructional and technical experts in all Microsoft technologies and they have the sole authority to deliver training for other Microsoft Certifications. It is great to be finally part of this community and I am looking forward to meet other MCTs. 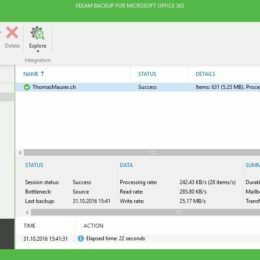 Some weeks ago Veeam announced Veeam Backup for Microsoft Office 365 and now you can finally download the Beta of it. 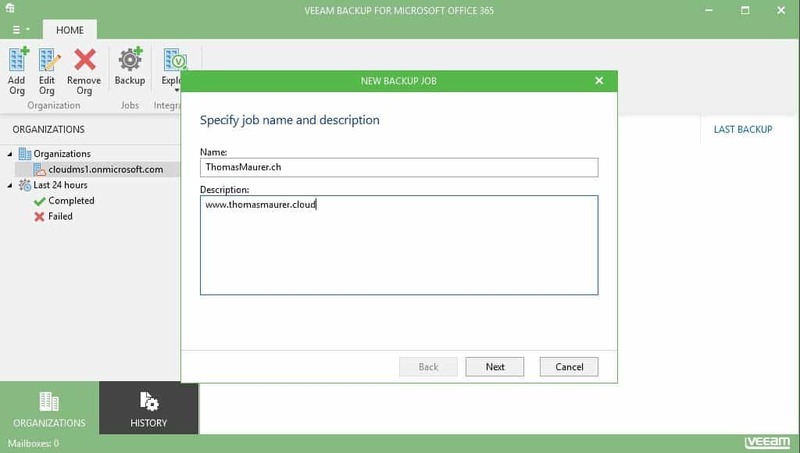 To be honest with you the installation is brutally boring and simple, so I will only show you how you quickly can create a new backup job. 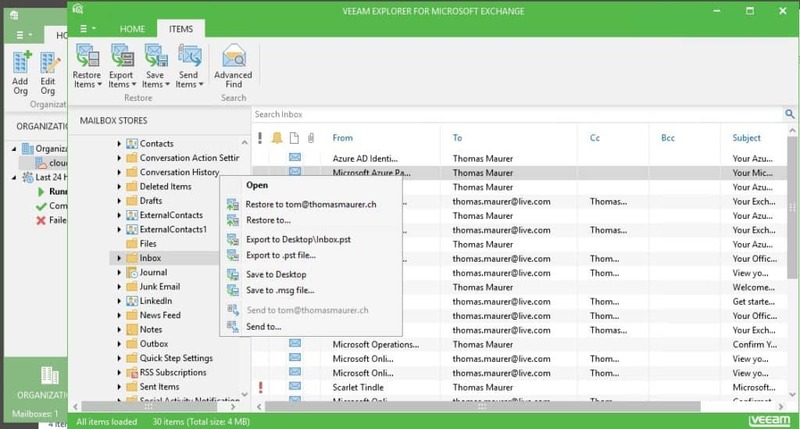 And guest what, with the Veeam Explorer for Microsoft Exchange, you can also restore mails from your Office 365 mailboxes. Check out the Veeam Backup for Microsoft Office 365 here. 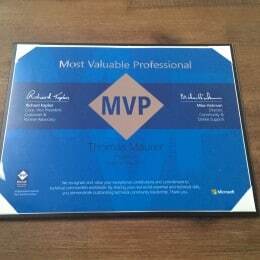 I am proud to announce that I just received my 5th Microsoft MVP Award for my focus in Cloud & Datacenter Management. 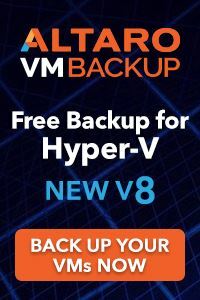 This is the 5th Microsoft MVP award in a row since 2012, 2013, 2014 and 2015. 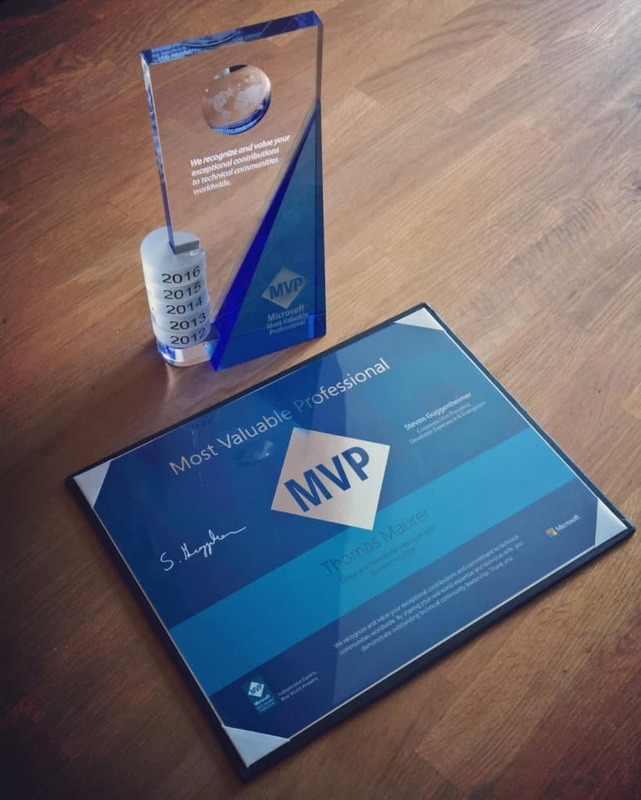 The Microsoft MVP award and the included opportunities add a huge benefit like the Microsoft MVP summit where you have the chance to talk to the Microsoft Product Groups, learn and place feedback. 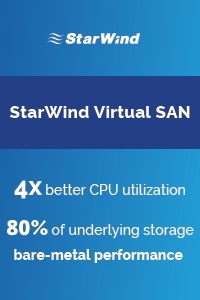 But of course the Microsoft MVP award also adds some other great advantages. In the past years I had the chance to travel all over the world and speak in different countries and events, and I met a lot of great people, which also became great friends. Of course there are a lot of people I have to thank, but I want to keep the list as short as possible. I would like to thank my employer itnetX which is supporting me in the best possible way year over year, my current and former colleagues, the Microsoft MVP community and of course Microsoft employees in Redmond and all over the world. Scheduling meetings can be a real pain you have to do calls, ask people and check calendars which can be a huge time effort. Lucky there are solutions like Doodle to schedule meetings and a lot of us are using Doodle in our personal life which is great, but it could be a lot better, especially if you are using it for business meetings. 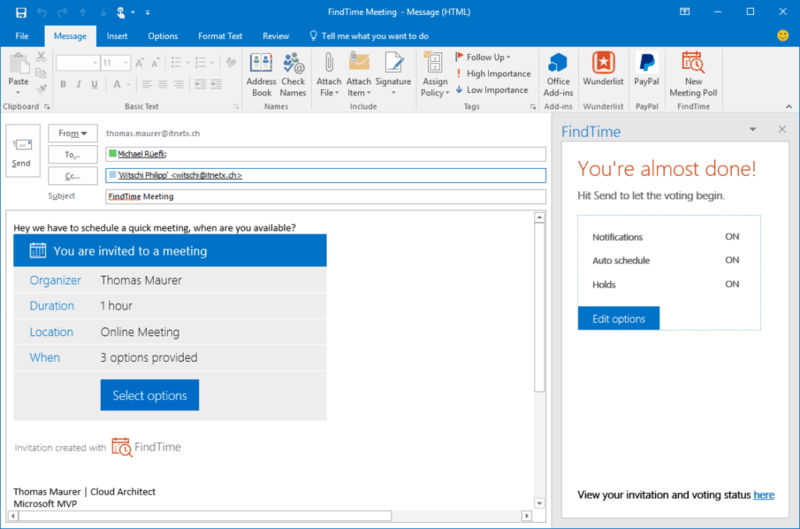 Microsoft released a Outlook solution for this a couple of months ago called FindTime for Outlook. 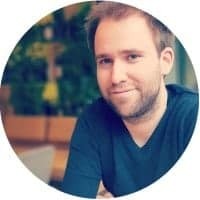 But since not a lot of people seem to know about FindTime I decided to write a quick blog post about it. Click “New Meeting Poll” in the Message tab of the email. This will open a new poll and will automatically check if people in your organization are available or not, depending on there calendar. External people will just show up in grey. You also have different options from Online Meetings (using Skype for Business) or meetings in different locations. People will then get the link to vote for the meeting date. You also have different options like Notifications when someone votes, Auto scheduling of the meeting if everyone required has voted and more. People can now vote on the FindTime website. People can also use preferred dates and can see how others have voted. 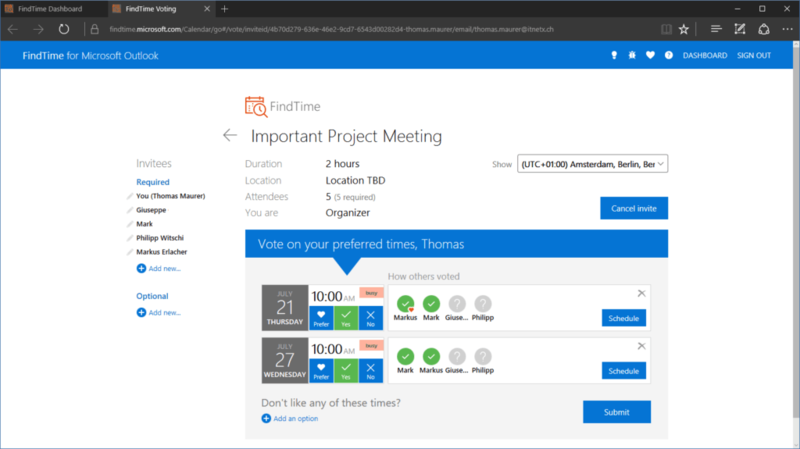 You can schedule the meeting manual or you can set the option to auto schedule, this will automatically send the invites after everyone required for the meetings has voted. 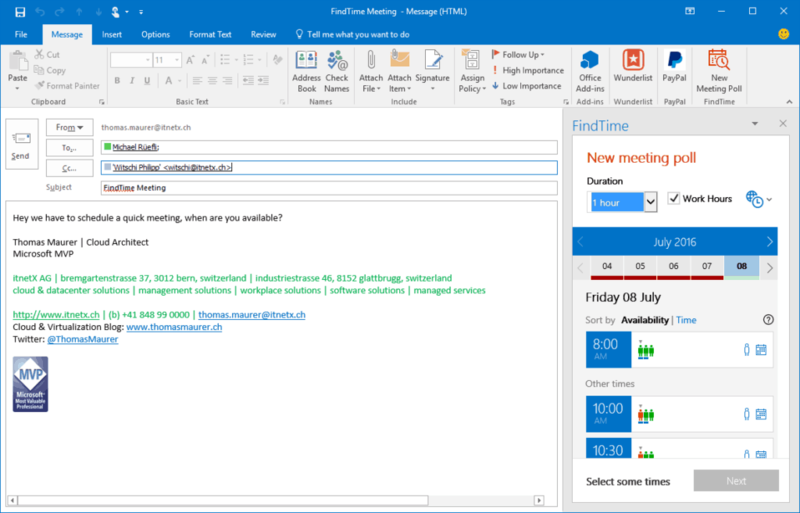 For me FindTime for Outlook is a huge time saver if you have to schedule meetings and appointments with other attendees. So make sure you have a look at it, the only thing your organization needs, is a Office 365 subscription. Last week we finally go our Microsoft Surface Hub for our itnetX office in Bern and I had the chance to do some testing. The Surface Hub is an interactive whiteboard developed by Microsoft ideally for business meetings. Before I get started let me show you the specs for the Surface Hub devices. Microsoft offers two models right now, a 84-inch model and a 55-inch model. The Surface Hub 84” model is ideal for medium and large conference room and it allows three people to comfortably interact with the screen simultaneously. The 84” version has also a 4K resolution, an Intel i7 processor, 128GB SSD, 8GB of RAM and a NVIDIA Quadra K2200 graphics card. The Surface Hub 55” model is perfect for smaller conference rooms and in work environments where you’ll move your Surface Hub into different spaces. The 55” model comes with a Full HD resolution, an Intel i5 processor, 128GB SSD, 8GB of RAM and integrated Intel graphics. Both model feature a 100-point multi-touch display, 2 passive Infrared Presence Sensors, Ambient Light Sensors, 2 front-facing stereo speakers, 2 wide angle HD cameras, active pen support, Windows 10 and a wireless keyboard. To see the full specs of both devices check out the Microsoft Surface Hub website. 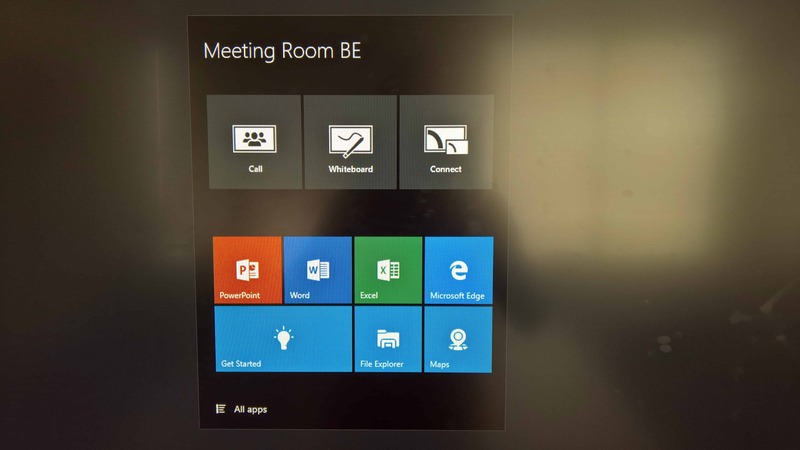 My first impression was the Surface Hub looks great, it is perfect for every meeting room and it is very easy to use. 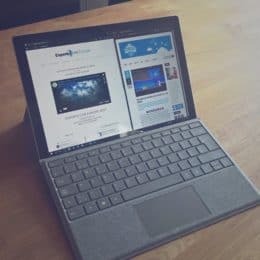 The quality of the devices is, as usual for Microsoft Surface devices, really great and feels like a high quality premium device. When you come in come in the conference room use first see the big screen and showing the time, the next scheduled meetings and the most important apps like the whiteboard, wireless screen sharing. 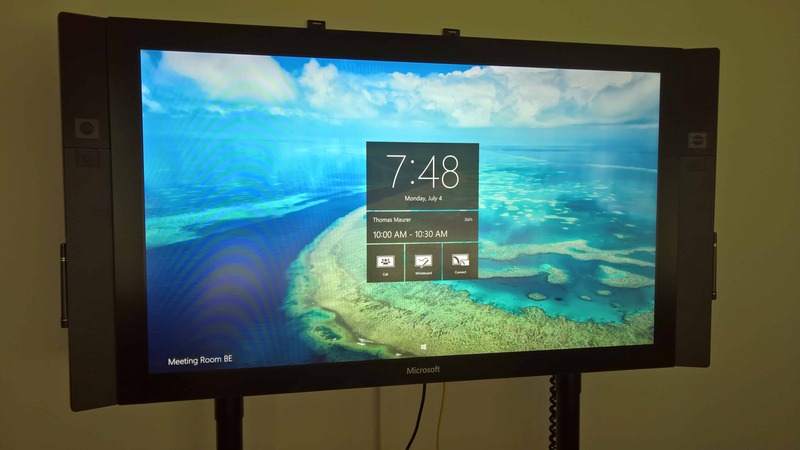 The Microsoft Surface Hub offers different meeting options. 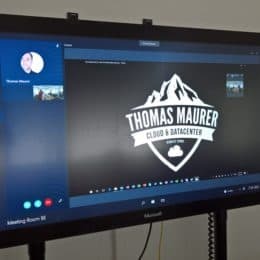 You can use it for in person meetings in the meeting room as a beamer replacement or wireless display for your notebook, as a whiteboard or use other apps like Office (Word, Excel, PowerPoint), Maps app or many more to come. The other thing the Surface Hub does very well is video conferencing using Skype for Business using the same apps and features. If you are using the meeting room for a meeting with persons in the room, the multi touch screen and the apps are great. I really like the whiteboard app which allows you to draw diagrams and other stuff. A nice feature is that when you take on of the pens out of the holder it automatically open ups the whiteboard app and you can immediately start drawing. You can also use the screen as a display for your notebook as beamer replacement. You can use the screen as a wireless display using Windows 10, Windows 8 or Windows 10 Mobile and of course the display also features cable input for DisplayPort, HDMI or VGA. 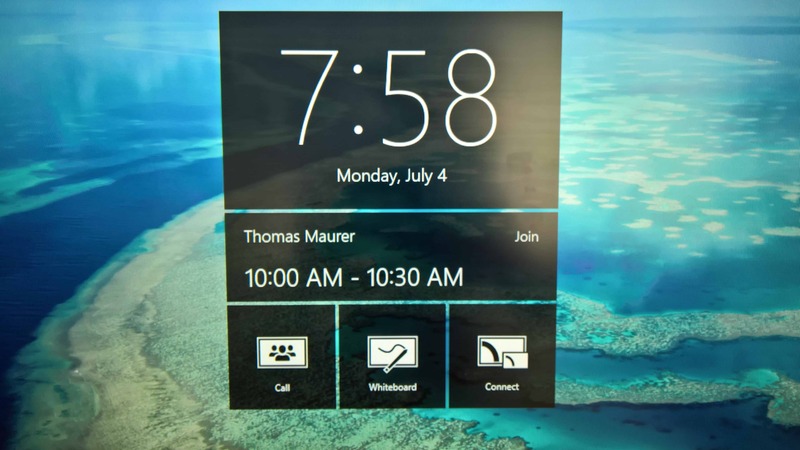 If you use the wireless display connection in Windows 10 you can also allow input from the Surface Hub screen back to your Windows 10 computer. For example you project your screen to the Surface Hub to show a PowerPoint slide deck for example, you can stand up and touch the screen for the next slide or draw on the slide it self. 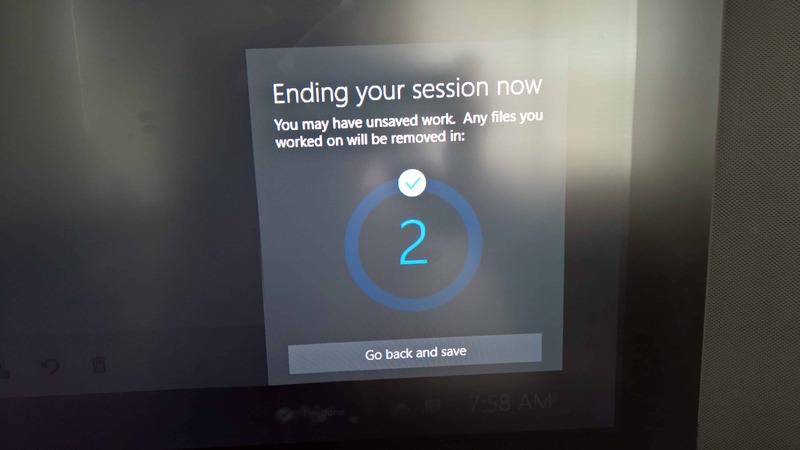 By the way, connecting wirelessly is very fast, I used several different devices to connect with my Windows 10 devices using Miracast, like the Xbox One or the Microsoft Wireless Adapter, but none of the devices connected as fast as to the Surface Hub. And of course this also works with other devices supporting Miracast like Windows 10 Mobile (especially cool with the Windows Continuum feature) and for example Android smartphones. The other great scenario is using the Microsoft Surface Hub for conference calls. 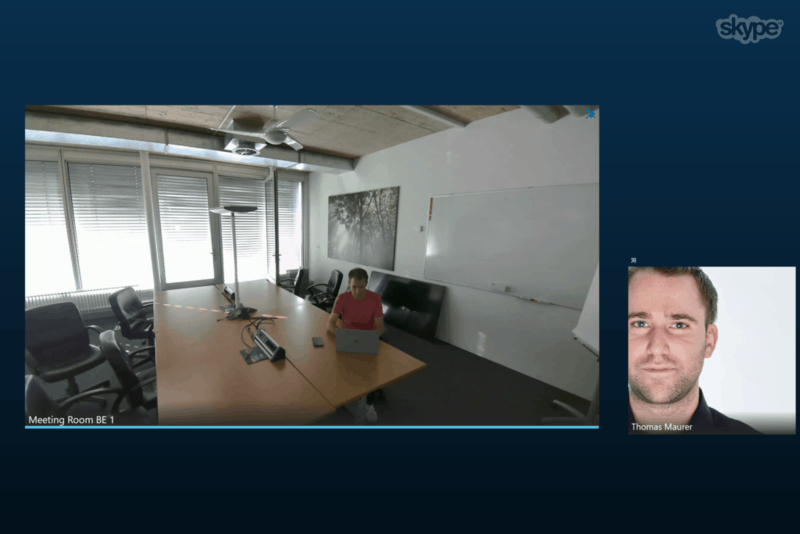 You can join Skype for Business Meeting adding the Surface Hub device as a resource and it will automatically show the Skype for Business Meeting and you can join the meeting. You can also just invite other people using sending Skype for Business invites or using phone numbers to call them. You can also add the Surface Hub to an existing Skype for Business meeting or call your Surface Hub using a phone number. The two wide angle Full HD video cameras are great and show the whole meeting room. If there is a single attendee in the room the camera also focus on him and follows him instead of showing the whole room. The great thing here is that you again can use the same features and apps like the whiteboard, screen sharing and the apps. 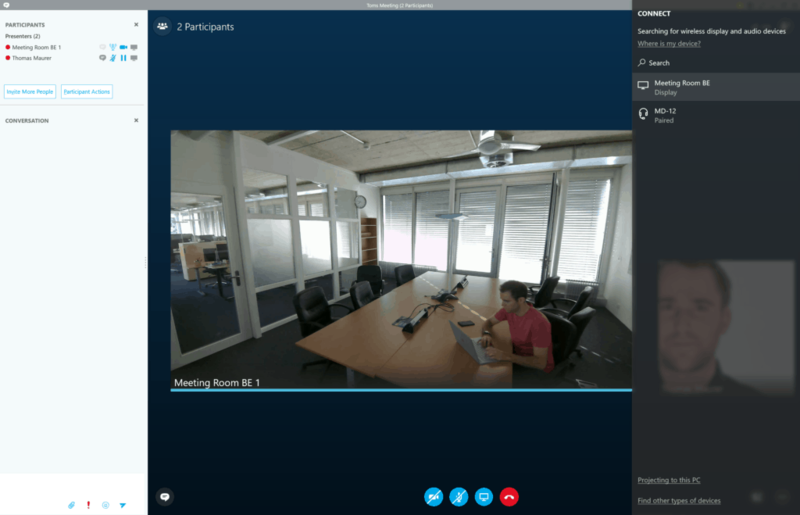 For example one scenario can be that several people sitting in the meeting room and one of the shares the screen to the Surface Hub, the Surface Hub is joined to a Skype for Business meeting with some remote attendees. 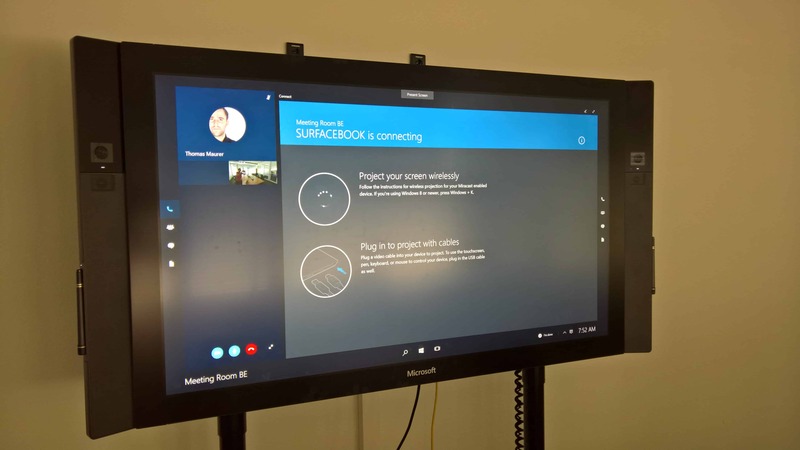 The screen of the Surface Hub, showing the screen of the notebook of attendee in the meeting room is also shared with the Skype for Business remote attendees. Or you can see the screen sharing or presentation of remote attendees. The most important thing here is, that is very easy and simple to use and it just works as expected. 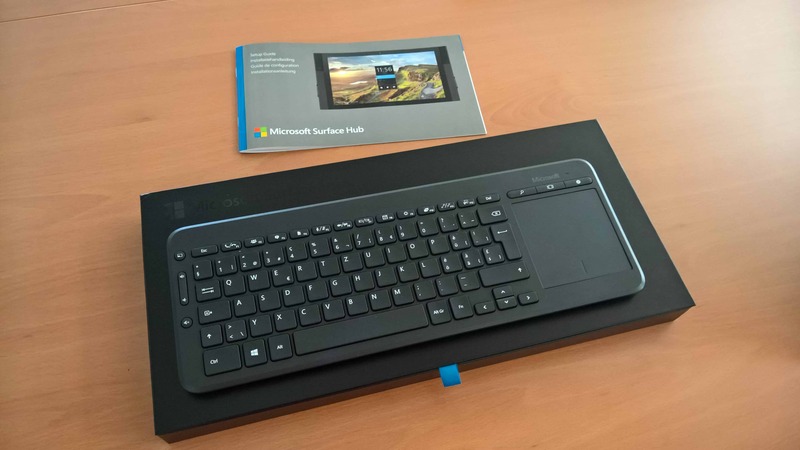 It looks like we are getting now more Surface Hubs for all the different office locations, so we can do meetings between the office in Bern and Zürich. 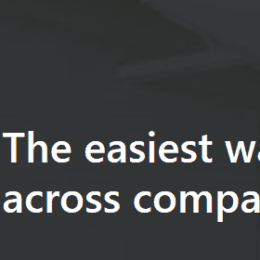 Now setting up a meeting or joining a meeting is really simple, and basically everything is possible. But what after the meeting is finished? 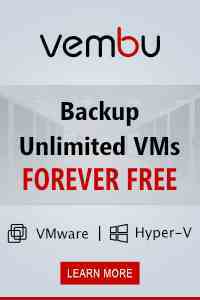 You can very simple clean up your workspace and everything is gone, and no one can access your data. As mentioned the Surface Hub comes with different apps like the whiteboard which lets you also do drawings, Office which lets you to use office documents like Word, Excel or PowerPoint and you also have the Maps app and the Microsoft Edge browser available. The Apps for the Surface Hub seem to be limited right now, but my guess is that Microsoft will soon enable the Windows Store to let you download and install apps on the Surface Hub. 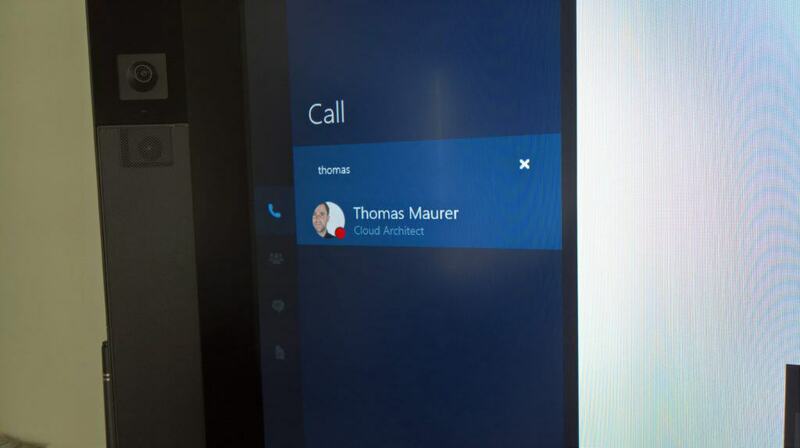 Microsoft has some example of apps on there Surface Hub website. 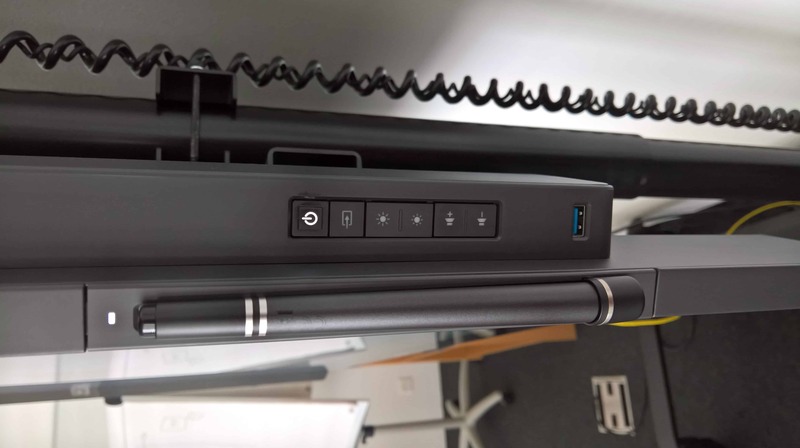 You can open Office documents from SharePoint, OneDrive, OneDrive for Business or SharePoint Online using Office 365 or connected USB devices directly from the Surface Hub, or you can share them from your notebook using screen sharing. 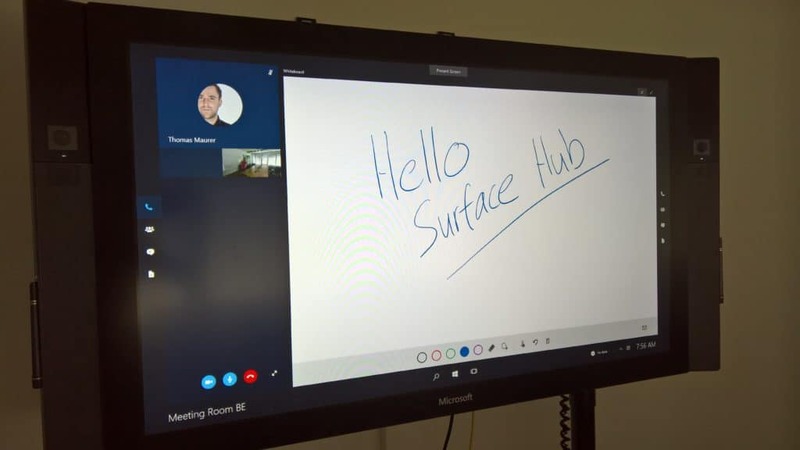 The Surface Hub is an amazing device and we are very happy with the it, the device is great, works very easy and simple and it adds a lot of value to your meetings. If you ever have done a meeting using the Surface Hub you really want to have one for your self. If you have more question about the Surface Hub and his features and functionality just leave a comment.